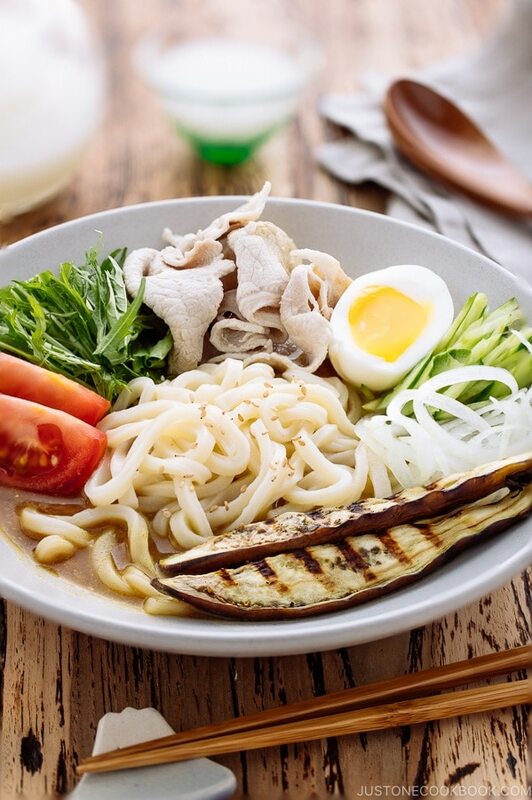 Cold Curry Udon is chilled udon soaked in curry soup, topped with sliced pork, boiled egg, sliced onion, julienned cucumber, mizuna leaves, tomatoes, and grilled eggplant. It’s a colorful, nutritious and refreshingly savory summer dish! If sandwiches are a common lunch menu in the United States, noodle dishes are the equivalent counterpart in Japan. We eat noodles all year round because nothing will keep Japanese people from their noodles. During the summer months, noodle shops offer extensive cold soba or cold udon noodle menus that refresh the palate and keep things cool. 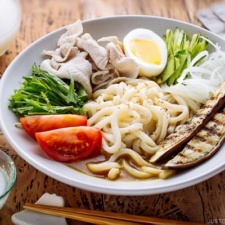 Home cooks in Japan make varieties of cold noodle dishes, and today’s recipe – Cold Curry Udon (冷やしカレーうどん) – is enjoyable to dig into during these sweltering days. The refreshing contrast of textures and flavors is one of the key advantages of this recipe. It also features the freshest, crispest summer vegetables available at the market: tomatoes, cucumbers, fresh greens, and eggplant. Change up the ingredients and you can easily live off a variation of this cold curry udon all season long. For a well-balanced bowl of noodles, it is fairly straight-forward and quick to assemble. 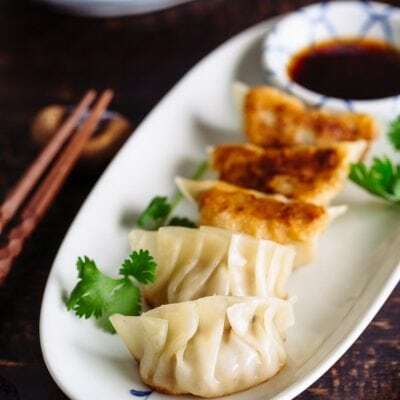 You can prepare all of the components ahead of time and keep in the refrigerator until you’re ready to eat, which makes it an ideal weeknight meal. 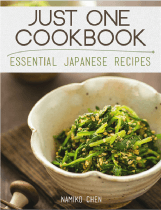 If you enjoy Japanese Curry, you will love this dish! The mild flavor of silky udon noodles and bold curry, when paired together, are surprisingly accommodating. 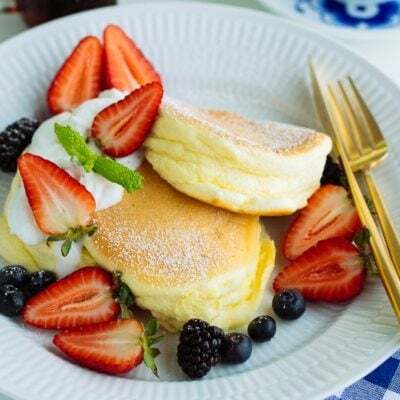 They can take on an array of ingredients and taste delicious every time. Have some leftover grilled meat or vegetables from the weekend barbecue? 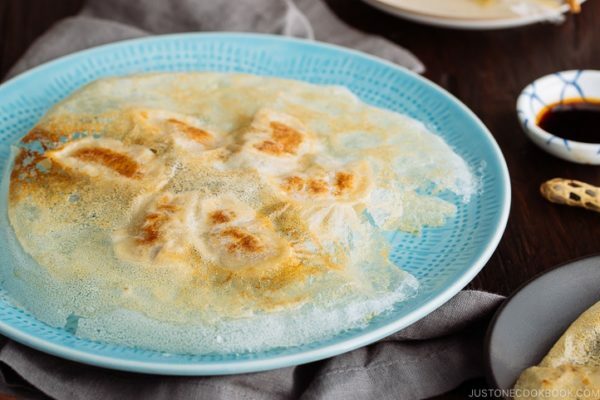 Toss them into the noodles. Take a quick scan around your refrigerator and you’ll find some fresh produce ready to be used. 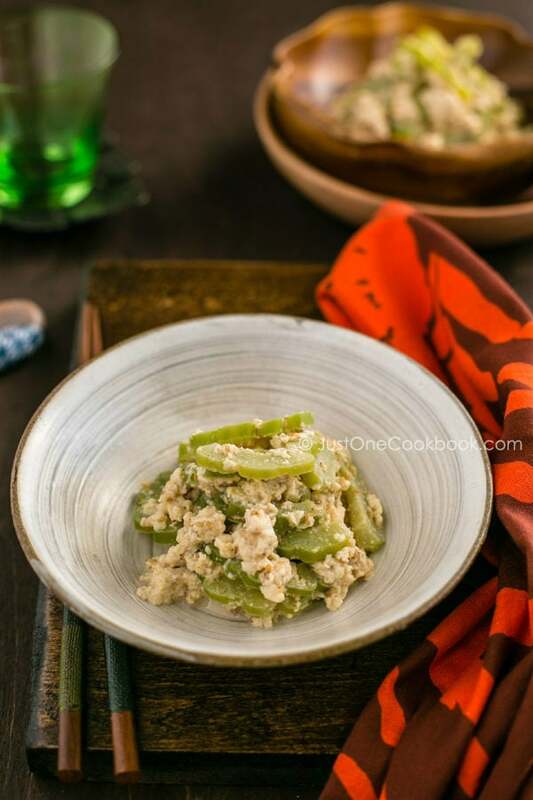 Because you don’t cook the ingredients with the curry roux, you can add uncooked vegetables as toppings for this cold curry, which is another reason why it can be made really fast. 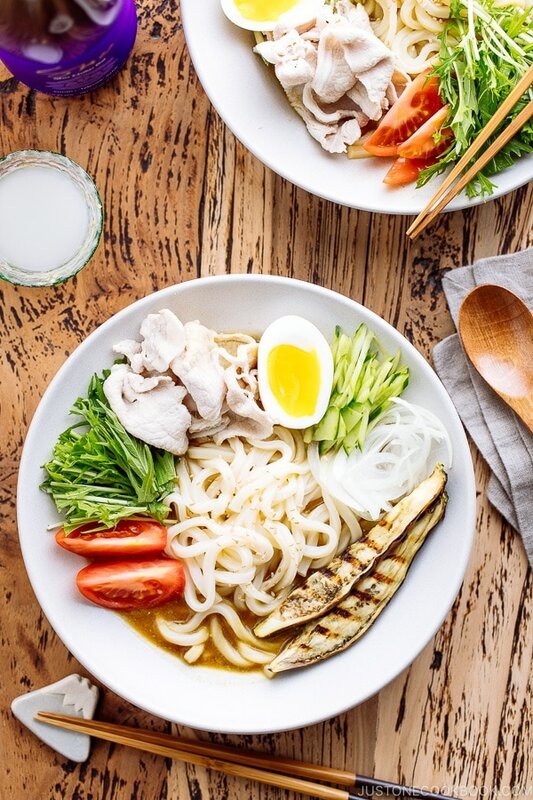 Sometimes delicious food may not be nutritious, but this Cold Curry Udon is filled with veggies and protein – which makes it wholesome and satisfying. It’s easy to lose appetite on hot summer weather, but curry helps revive the appetite, and serving it chill adds a more appetizing effect. But if you don’t mind sweating over a hot noodle soup on a hot day, I have regular Curry Udon recipe that you can enjoy as well. Let’s look into the ingredients that make this cold udon bowl. 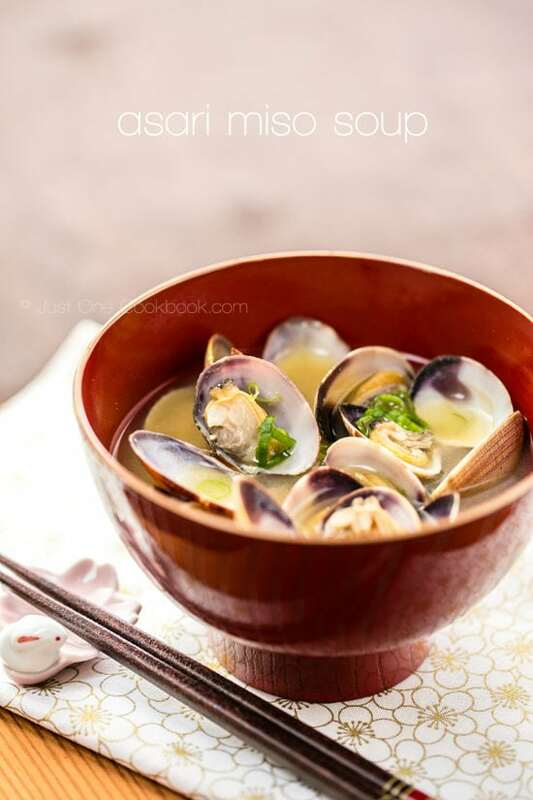 Dashi: For the authentic Japanese flavor, I strongly recommend using dashi as the curry soup’s broth. 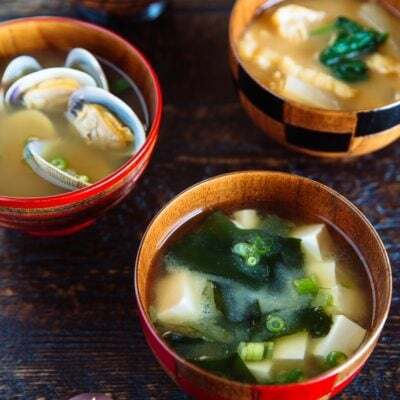 You can either make dashi from scratch or use the convenient dashi packet method or dashi powder (See 3 ways to make dashi). If you really have to skip it, then use chicken stock instead. I haven’t tried it with chicken broth, but it should be okay. Thinly Sliced Pork: Japanese, Korean, and Chinese grocery stores sell thinly sliced meat in packages. No access to these grocery stores? 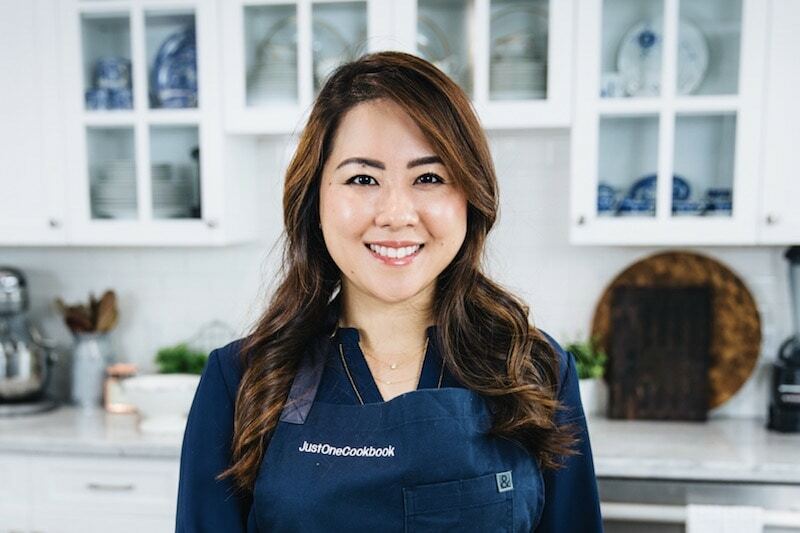 You can prepare your own thinly sliced pork by following my step-by-step guide or video tutorial. If you don’t eat pork, chicken or prawn would work too. Japanese Curry Roux: If you are interested in avoiding MSG and making your own curry roux, please follow my homemade curry roux recipe. Sake & Mirin: Read more about these condiments in the next section. For substitute info, please click here. Toppings/Ingredients: It is a highly adaptable dish, so feel free to work with a colorful variety of vegetables and protein of your choice. You can pretty much prepare everything ahead of time as the toppings are best to be chilled. When you’re ready to serve, you just need to assemble the bowl together. Perfect for a make-ahead meal. 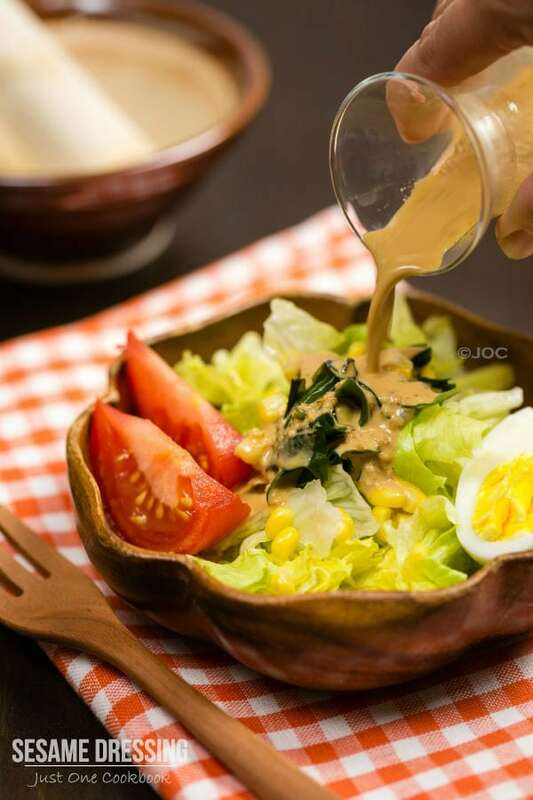 To make the curry sauce for this recipe, you’ll only need 4 simple ingredients: Japanese curry roux, sake, mirin and soy sauce. 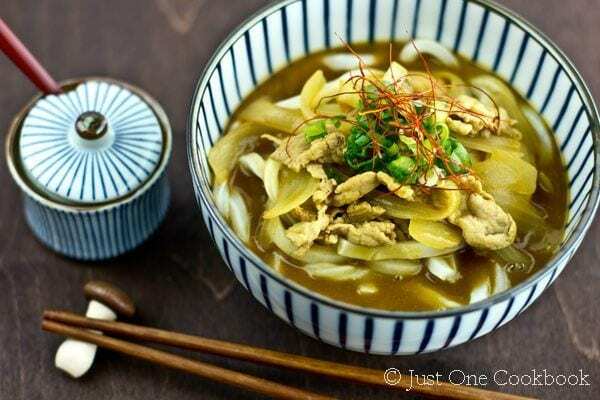 Both curry roux and soy sauce may not need further introduction, but sake (fermented alcohol made from rice and water) and mirin (sweetened rice wine) are all part of the building blocks in maximizing the flavor of this Cold Curry Udon. 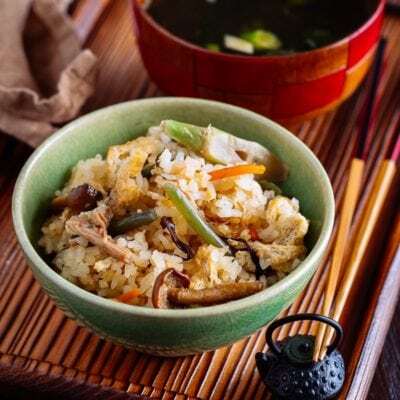 The benefits of cooking with sake and mirin are aplenty, and in this instance, sake lends acidity and helps intensify the overall flavor while mirin adds a subtle sweetness to the curry sauce. 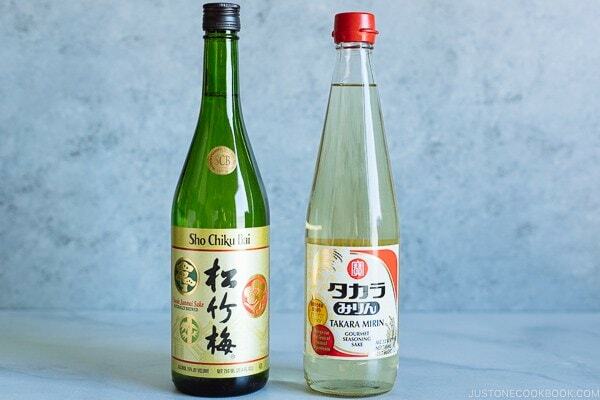 To learn more about the differences between sake and mirin, and the benefits of cooking with them, you can read up this post on the blog. 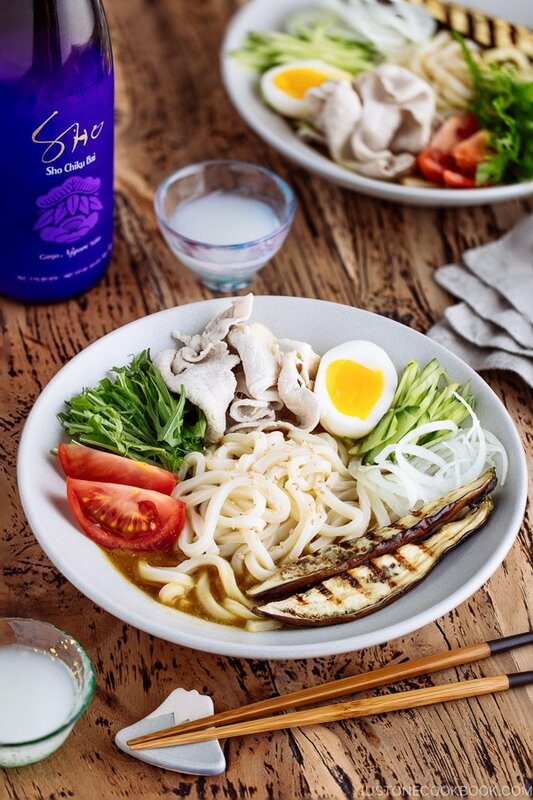 The sake and mirin I used for this Cold Curry Udon are from Takara Sake, which has more than one-and-a-half centuries experience in Japanese alcohol production. 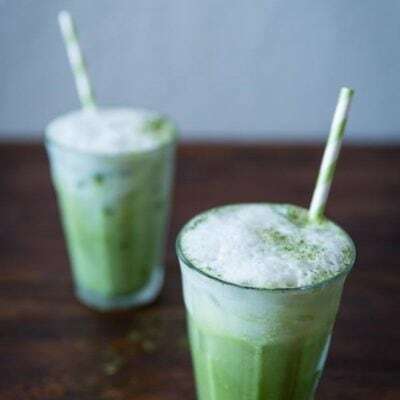 In the US, they are based out of Berkeley, California but you can also find them online or at some local sake or liquor stores. While cold beer is always welcome, sake tends to work very well with light cold noodles. 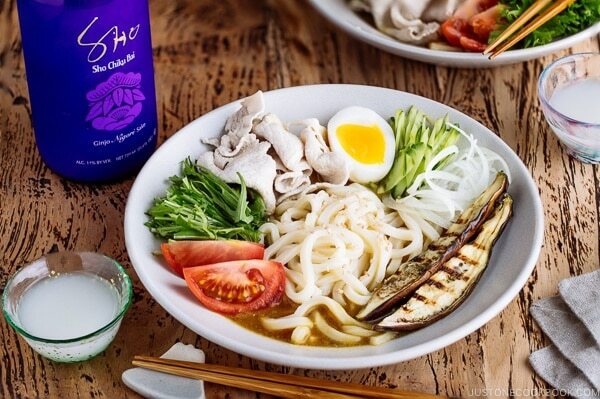 With this Cold Curry Udon, we’d pair it with Sho Chiku Bai SHO Ginjo Nigori Sake by Takara Sake. In case you are not familiar with different types of sake, nigori sake is cloudy as it’s less filtered than regular sake, and still contain rice particles. 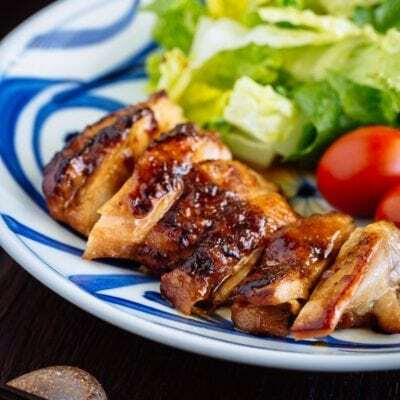 Nigori sake is typically sweeter and works well with spicy and flavorful food like barbecue, Mexican food, and curries. For this cold udon curry, Sho Chiku Bai SHO Ginjo Nigori Sake worked perfectly as it is very fruity and just the right amount of sweet, with a slightly grainy texture. 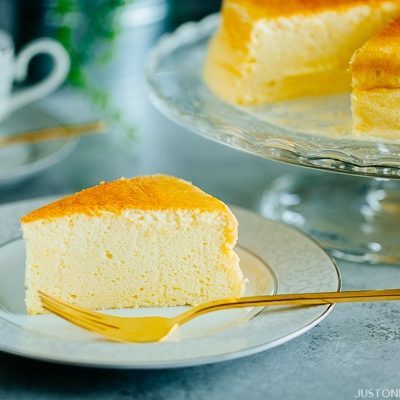 The sweetness cleans the palatte and makes every bite of curry even intense and flavorful. 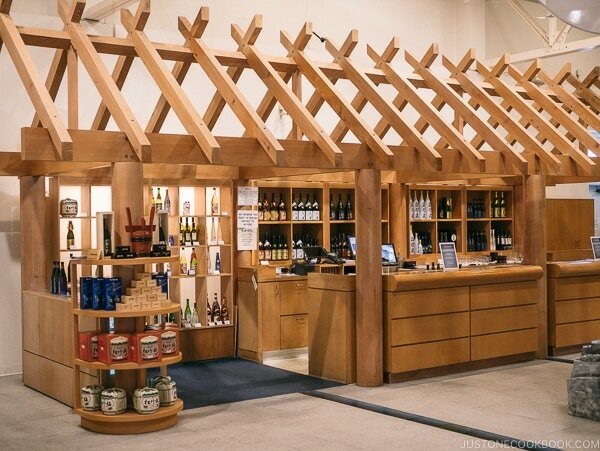 If you live in the SF Bay Area or plan on visiting San Francisco, we recommend stopping by the beautiful Takara Sake tasting room in Berkeley. 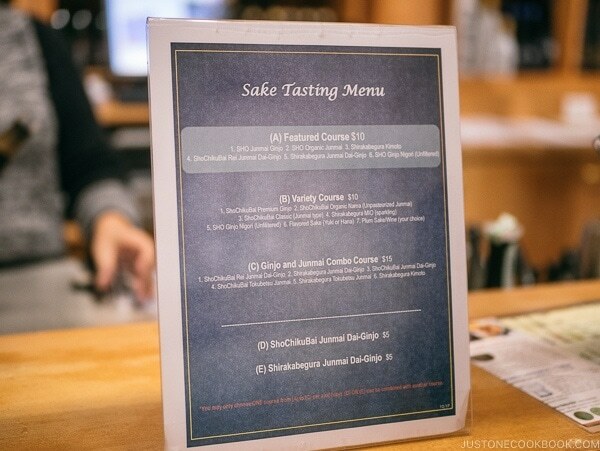 They have an amazing selection of sake and you get to sample different flights of the Japanese rice wine. 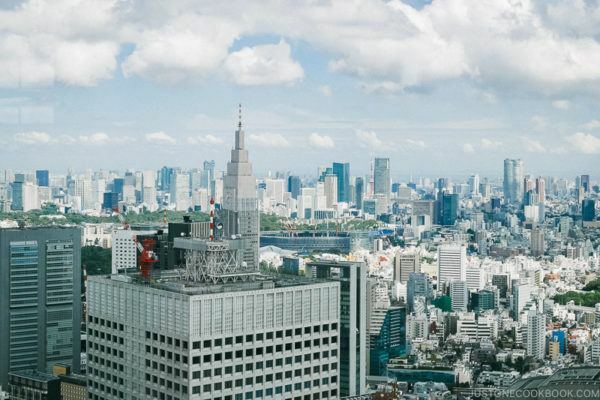 Whether you are a sake connoisseur or just a novice, it is definitely a fun place to go. And don’t forget to grab a bottle of Sho Chiku Bai SHO Junmai Ginjo to enjoy with this Cold Udon Curry! In a small pot, add dashi and bring it to boil over medium heat. Cook the sliced pork one at a time in the dashi. Try not to overcook as it gets tough. Once the pork is no longer pink, quickly remove from the dashi. Place the cooked pork in an iced water. Once cooled, transfer to a plate. Skim off fat and foam on the surface of dashi. Add the curry roux cube in a ladle and let it dissolved completely in the ladle. 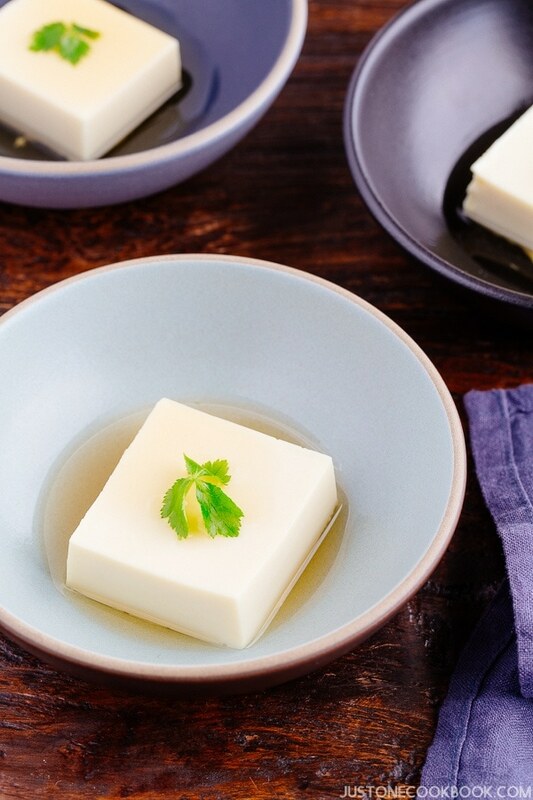 If you drop the curry roux cube in the dashi, it’s much harder to dissolve. 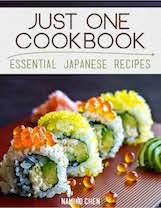 Add 1 Tbsp sake and 3 Tbsp mirin. Add 2 Tbsp soy sauce and mix together. Bring the sauce to a simmer. Skim off foam and cook for 1 minute. Let cool in an ice bath. Once it’s cool, you can move to the refrigerator. Cut the eggplant into 4 wedges lengthwise. Heat the oil in the pan. I use a cast iron grill pan to get the grill mark. 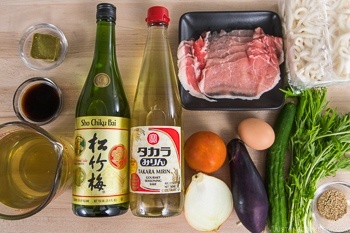 Cook all sides of eggplant until tender. Slice the onion thinly. I use the mandolin slicer to get thin onions. Soak in iced water to remove bitterness. Peel the cucumber skin alternatively. 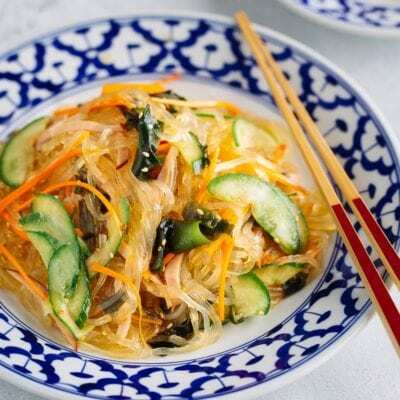 Slice the cucumber and cut into julienne strips. Cut the tomato into wedges. Cut the mizuna into small pieces. Pour the curry soup in serving bowls. You can remove fat on the surface of the curry soup with a fine mesh skimmer or strain the curry soup through a fine mesh sieve. Cook the frozen udon according to the packing directions. Drain and run under cold water to chill the udon. 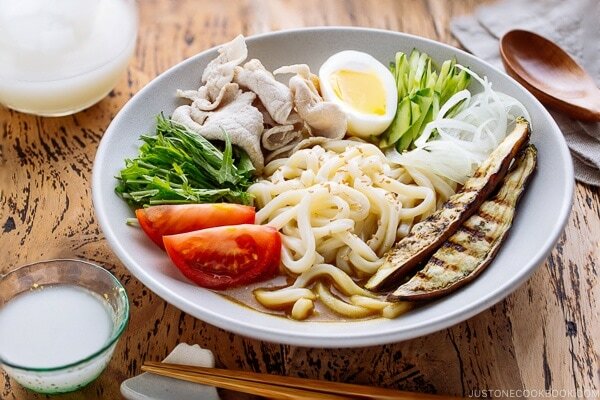 Place the udon in the curry soup and add toppings on the top. Can I check how many curry roux blocks to use? It’s not in the ingredients. Is it one cube (out of four) or do you use all of them (like making a curry)? Hi Corin! One cube (block) – and it’s located on top left in the ingredient picture (see the brown square roux?). 🙂 It’s 1 oz. or 32 g.